Accidentally deleting stuff of your phone or computer is a very common scenario for a lot of people. We just flick through files and folders and delete the whole thing, without taking a deeper look. Then, we realize later on that the pictures we deleted were very important. What do you do after that apart from cursing yourself? Nothing much. However, most people don’t know that there are ways by which the deleted pictures on the iPhone can be recovered. Most people generally create backups in order to make sure that they don’t suffer from unnecessary data loss. The iPhone has a very good backup option, which even allows you to store your images on the cloud. However, if you haven’t created a backup file for your phone, that doesn’t mean the pictures can’t be retrieved. There are several ways by which you can retrieve pictures from your iPhone. One of them is only applicable if you have a jail broken iPhone. The amount of things that you can do with a jail-broken device are much larger, and by using open source software program such as Photo Rec, your data can be recovered in full,provided the iPhone hasn’t overwritten it with new data. As soon as your pictures are deleted, the newly created space becomes available for use, and as a result, newly saved data is overwritten on those deleted pictures. Therefore, it is best to start the recovery process as soon as you realize that data has been lost. Rather than delve in to open source software programs, one of the best options available for people is to use the Wondershare Dr. Fone for iOS. Dr. Fone for iOS allows you to retrieve lost photos on iPhone by guiding you through a very simple interface. The program itself is extremely easy to use and supports a wide range of iDevices, such as the iPhone 5S, the latest iPad up till the iPad 2 as well as the iPod Touch 5. Support for iPod Touch 4 and the iPhone series is also provided. From messages to pictures to contacts, everything can be recovered using Wondershare Dr.Fone for iOS. The good thing about using this application is its user friendly interface; it allows you to view thumbnails of the pictures that you are recovering, and you can choose whether you wish to recover those pictures or not. 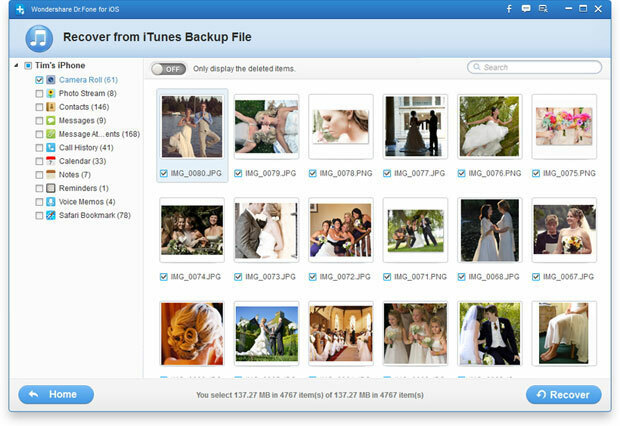 The program also provides you with a very simplistic backup option, allowing you to create a backup on your computer using iTunes. Wondershare is also available as a trial version which is valid for up to 30 days, providing people with a good option to check its features before making the purchase.